When you think Christmas cookie, macarons do not usually come into mind, unless you are me and have accumulated way too many egg whites. These pink and brown beauties are strawberry macarons with strawberry passionfruit ganache and chocolate macarons with dark chocolate mint ganache. 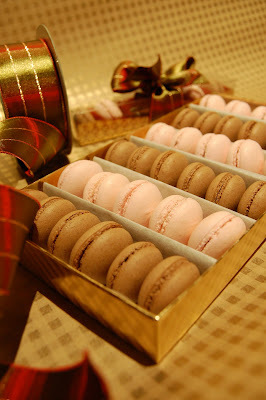 Packaging macarons is always a challenge since they are quite delicate and do not possess any flat surfaces. I must admit that I had a stroke of genius when I realized that the three toilet paper tubes awaiting the recycling bin (cut in half and covered with clean parchment paper, of course) were the perfect holders for six rows of macarons. In addition, Christmas must include chocolate. Dark chocolate truffles filled with my leftover strawberry passionfruit ganache are sparkling from edible copper dust. 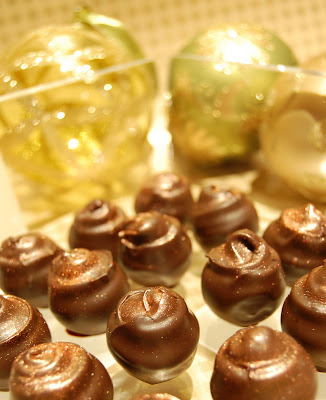 I also knocked out some molded bon bons which were filled with a gianduja ganache. So now, my home kitchen is quiet and closed for the season. Luckily, my busy work schedule will help me burn off the many calories which are headed my way in the very near future. When somebody asks me to make a cake, the first question I ask is always "how many people does it need to feed?". This critical number obviously decides the size of the potential cake and since my refrigerator and freezer space is limited, size definitely matters. Perhaps there will be a day when my cakes do not need to share space with my leftover chow mein or get cozy beside the frozen peas. 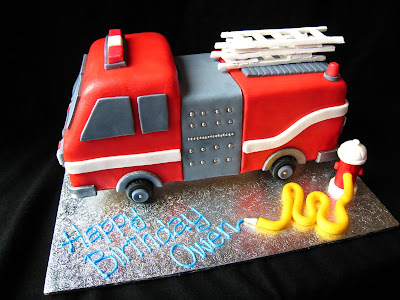 Meanwhile, this fire engine cake was for a very lucky little boy named Owen who just turned three. Originally, I had planned for it to feed 10 to 12 people but when I designed it on paper, the dimensions became approximately 12 x 5 x 5 inches. Apparently, I lack the gene that gives the ability to estimate volume because in the end, the fire engine cake could probably have fed 24 people easily. Owen had requested a chocolate cake so I created the fire engine from layers of chocolate cake and chocolate German buttercream. Covering the cake with the red rolled fondant caused a small panic attack because after prolonged kneading in almost half the vial of Wilton Red Red colour paste, the fondant was so soft that it started to shred at the corners. Luckily, I rescued it in time and smoothed it out fairly well. Seven hours later, the cake was finished. 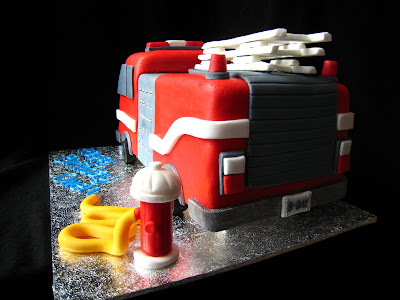 My favourite details on the fire engine cake are actually all found in the above photo. The pastillage fire hydrant (I really wanted to keep it) and the pastillage tires, complete with hubcap and tire treads, were adorable. 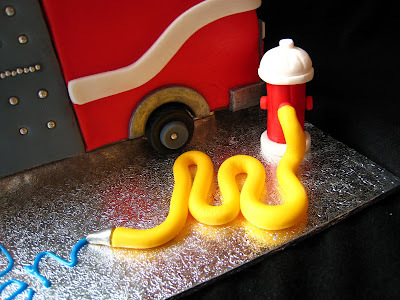 Because I did not want to put lettering on the actual fire engine, I decided to connect a hose to my fire hydrant which would be squirting out watery blue royal icing to spell out Happy Birthday Owen. 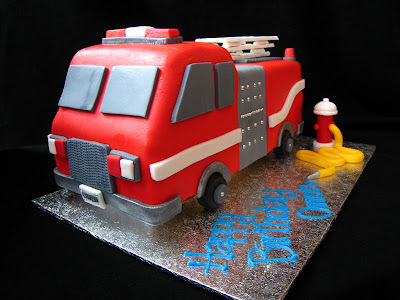 With the addition of some silvery details, the fire engine cake was certainly an accomplishment of which I am proud. Thankfully, I was not at the party to witness its eventual destruction! Yesterday, a seven feet tall Fraser fir was the newest addition to our home and dressed up with festive finery and glitter. Even though I voice my share of "bah-humbugs" during the holidays, at heart, I love Christmas and in particular, Christmas trees. Green and gold ornaments adorn our tree, with a lovely hand-made quilted tree skirt underneath. This time last year, pastry school graduation was imminent and I had a mild obsession with pastillage snowmen. As a result, this snowman family was born and will continue to grace my mantle for years to come. I can honestly say that, next to my wedding day, graduation from pastry school was the happiest day of my life. It represented the start of a new chapter in my professional life which I had always believed was unachievable due to my own insecurities and fears. Perhaps, I should have just succumbed to a life in pastry, full of sore backs, achy wrists, and scraped hands, over 10 years ago when my good friend Shelley created a personalized miniature Christmas tree as a Christmas gift. The central ornament, handcrafted by Shelley, is supposed to be me, in a chef's hat with the words, Baking Queen, now faded with time. Every year, I put my little tree on display and admired the tiny cookies and wooden spoons made of Fimo with a twinge of sadness. This year, I happily know that this tree does truly represent me.